Nikon is on the up when it comes to its compact cameras. And if you're looking for a high-end model then the Coolpix P7800 may have already made it onto your shortlist, alongside similar models such as the Canon PowerShot G16. Ultimately similar to the previous generation Coolpix P7700, the P7800 adds one crucial feature to the burgeoning feature set: a built-in electronic viewfinder. It's a small one, mind, but that means it doesn't impact on the established design. It's a fairly chunky unit, however, but comes dressed with an abundance of physical controls to suit the demanding snapper. Has Nikon hit the nail on the head with the P7800 or is this bulky "performance" line still short of the mark, particularly in a market where designs continue to shrink? We've spent a long weekend in the Peak District with the Coolpix in tow to see whether it all adds up. Not many compact cameras come with a built-in viewfinder. 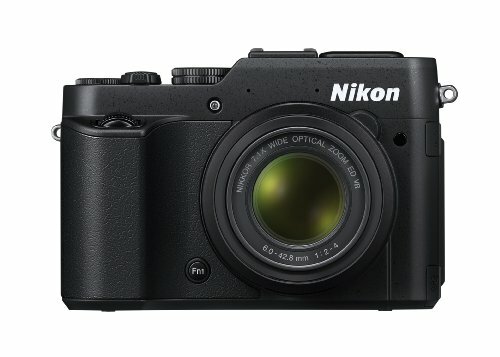 Nikon has made the decision to include one in the P7800, opting for a 0.2-inch, 921k-dot electronic offering. It's not particularly large, nor resolute, and there's no auto eye-level activation either. But for all its downsides the positive is that, well, there is one featured at all. We prefer this full-field-of-view electronic offering compared to similar competition such as the limited-field-of-view optical finder found in the Canon PowerShot G16. So well done Nikon, this is a step ahead of where the P7700 was, and a preferred solution to the not-so-good optical finder in the earlier P7100. We found ourselves using the rear 3-inch, 921k-dot, tilt-angle LCD screen for the most part, though, but having that finder as a backup was a useful option. The more we checked images over on a computer screen, the more we realised how the LCD screen is only an approximate measure of exposure when outdoors, with many of our exposures a little off as a result. That prompted us to use the viewfinder more and more. However, when cameras such as the Olympus Stylus 1 have considerably better viewfinders, the P7800 does feel somewhat like the Coolpix is a generation behind. We tended to use the P7800 as an exposure guide only, as the lag when panning was an irritation. The addition of the viewfinder doesn't mean there's no hotshoe. If you want accessories, such as off-camera flash, then compatibility with the Nikon Creative Lighting System is a definite positive. Which leads us to the other prominent feature of the P7800: physical dials and controls. It's just what advanced photographers like to see, as it limits the amount of menu digging that's necessary. In addition to the exposure compensation dial, there are front and rear thumbwheels, a rotational read d-pad, physical main mode dial, and two dedicated function buttons. For the most commonly used controls there's a Q Menu button which opens an on-screen menu divided into categories. Problem is it's not that quick - there's slight lag between pressing a directional button and this being shown on screen. We would expect a high-end model such as this to be instant, particularly in the smartphone age. It's a familiar tale with the Nikon P340 too. The main control that lacks is a lens control ring. Instead controlling the Coolpix P7800's 28-200mm f/2.0-4.0 equivalent lens is handled using a zoom toggle around the shutter button. No problem, as such, but it'd have been great to have click-based aperture controls and a smooth, precise manual focus adjustment. Think Olympus XZ-2, for example. All these physical controls do add to the general bulk of the camera, which is a sizeable lump all told. In an age where camera bodies tend to be shrinking - and if not, larger models contain larger sensor sizes - this particular Nikon bucks the trend. It's chunky, but it seems proud. We're a little late to the P7800 review party, and as a result its market price has naturally dipped. At the time of writing it's £410, which is a far more admirable number than its original list price. Does its performance reflect its price point? We found the autofocus system to be fast and accurate, even if it's not the fastest in its class. Low-light conditions slowed things down a significant degree, but the camera would still deliver, which is the most important thing. Autofocus doesn't appear to have changed since the previous model, however, hence it not feeling so swift in the fast-moving market. More impressive still is the macro mode. Here it's possible to get some great results, with the "macro close-up" option meaning the 28mm wide-angle setting can more or less touch the subject that's being shot. However, don't forget when the mode selected, otherwise normal focus will often fail and seem much slower. A simple settings adjustment will fix this, but macro doesn't kick in automatically. Burst shooting is one of the P7800's other fast features, or at least it is when shooting rather than writing. The eight frames per second (8fps) mode was able to capture six raw & JPEG frames in our test, but the process of storing this data on the SD card means the camera is unavailable to do anything else for at least 20 seconds. So if you need to use the burst mode then make sure you hit the shutter at the exact right moment, otherwise you'll be stuck waiting, fingers crossed that you've got that magical shot in the bag. Overall the P7800's performance matches that of the P7700, albeit with the addition of a viewfinder. That's a commendable performance, but as time has moved on it doesn't feel as though the P7800 is best in its class. It's the price point that adds appeal and makes that an acceptable proposition. With a lens and sensor combination identical to its predecessor the P7800 succeeds in - unsurprisingly - delivering the very same image quality. In general that's a good thing: shots are sharp and the 12-megapixel sensor doesn't squeeze excessive numbers of pixels into the equation. The 1/1.7-inch sensor size isn't as large as you will find in the Fujifilm X20, however, and given the chunky overall size we'd opt for the Fuji out of the two. The Nikon's ISO 80-3200 sensitivity range isn't trying to show off by offering five- or six-digit sensitivity numbers, but instead focuses on the core range where it can perform best. Set to Auto ISO, for example, and the P7800 automatically caps the maximum sensitivity to ISO 800. The camera knows it's not the world's strongest performer above this sensitivity is probably why, as above ISO 400 there's a clear essence of image noise visible throughout a shot. At the lowest ISO sensitivities we're rather impressed by what we've seen though. It's the sharp lens that makes the P7800's images stand out, which is what will really matter to discerning snappers. We've used some cameras over recent months, such as the Samsung Galaxy Camera 2, where zoom comes at the expense of sharpness to excess. The Nikon doesn't sacrifice sharpness based on zoom. There are some great features on board to ensure an optimum image too: a neutral density (ND) filter should you want to use the maximum aperture in brighter lighting conditions; a minimum shutter speed ensures sharp capture in tricky conditions (unless it's so dark shooting isn't feasible); and raw capture for optimum creative control. Raw files show how much distortion correction and adjustment goes into the JPEG files, but shooting raw still has its benefit if you need to adjust exposure a small amount in post-processing. We'd use it as a backup rather than a mainstay as we do with our DSLR. There might be no leap forward compared to the previous model, but the Nikon P7800's images offer plenty to like. They lack the processing finesse and "pop" of the Canon G16, but Nikon is well in the runnings here, just don't expect magic things at the higher ISO settings. If you're after a high-end compact camera with an abundance of features then the Nikon Coolpix P7800 certainly ticks all the boxes, but it just doesn't quite excel in every department. Good rather than great is the overall sentiment. We're sold on the presence of a viewfinder - and find an electronic one preferable to an optical version in this instance - and yet the P7800's 921k-dot panel doesn't feel as high-spec as we'd like. The camera's chunky build, lack of a physical lens control ring and not-so-large sensor are other elements to consider; elements that competitor models deal with in different ways. Whether the larger sensor of the Sony Cyber-shot RX100 for better-yet image quality, the dual lens control ring of the Olympus XZ-2, or the larger optical-meets-digital viewfinder of the Fujifilm X20 - there are options aplenty out there. And that's not to mention the similar Canon PowerShot G16. The Nikon Coolpix P7800 does avoid the ever-increasing price wall within its category, however, so if you're after something a little more modest for an affordable price then it has definite high points, such as the sharp results from that 28-200mm lens. It's a solid balance of price to features and ticks plenty of boxes.